New Mexico's national parks blend unique geological landscapes, volcanic, desert, and gypsum dune fields, with the intriguing and fascinating remains of the historic pueblo people and culture. There are 15 national parks in New Mexico, including national monuments, historical parks and trails, and preserves. According to the National Park Service, nearly two million people visit these parks every year. Designated a UNESCO World Heritage Site in 1987, Aztec Ruins National Monument preserves the remains of an Ancestral Pueblo (formerly Anasazi) village on the terraces of the Animas River. The site was called Aztec because early settlers believed that the Aztecs had built it, but it was actually constructed several hundred years before the Aztec civilization's time. Built and used between 1100 and 1300 CE, Aztec Ruins includes several Pueblo Great Houses, the largest containing 400 masonry rooms. Several rooms still contain the original beams of pine, spruce, and aspen extracted from the distant mountains. Those beams are sufficiently intact and are used to peg the chronology of the occupation using dendrochonology (tree rings). Each great house has a great kiva, a large circular subterranean chamber used for ceremonies, and room blocks built around an open plaza. Three unique above-ground kivas encircled by three concentric walls can be found at Aztec Ruins. The Ancestral Puebloan people also built roads, earthen berms, and platforms, as well as irrigation ditches to sustain an agriculture based on the "three sisters" of corn, beans, and squash. At an elevation between 5,630–5,820 feet above sea level, the environment of the ruins is a diverse habitat of grasslands, piñon pine, and juniper trees, supporting a wide variety of mammals, birds, amphibians, and reptiles. Bandelier National Monument, located near Los Alamos, was named after anthropologist Adolph Bandelier, who was taken to the ruins by Jose Montoya of Cochiti Pueblo in 1880. Montoya told Bandelier that these were the home of his ancestors, and archaeological research supports Cochiti oral history. The park is set at the southern end of the Pajarito Plateau, a region formed by volcanic eruptions about 1.5 million years ago. Several rivers cut narrow canyons into the plateau, which eventually empty into the Rio Grande River. Between 1150–1550 CE, the Ancestral Pueblo people built homes in the canyon walls carved out of the volcanic tuff, as well as masonry houses along the rivers and on the top of the mesas. Bandelier contains the Bandelier Wilderness, a protected area of diverse habitats, including piñon-juniper woodlands, ponderosa pine savannas, mixed conifer forests, desert grasslands, montane meadows, and riparian areas in the canyon bottoms. Capulin Volcano National Monument, in the northeastern part of the state, near Capulin, is dedicated to the preservation of the geological landscape created by a 60,000-year-old volcanic eruption. Capulin is the Mexican-Spanish name for chokecherry trees, a common sight at the park. Capulin contains the cinder cone and crater lake of the now-extinct volcano, lava flows, tuff rings, domes and part of the immense andesite shield volcano called Sierra Grande. The volcano is part of the Raton-Clayton volcanic field, the eastern most Cenozoic-era volcanic field in the United States. The field is presently dormant, with no activity in the past 30,000-40,000 years. The location of a volcanic field in the interior of a continental plate rather than at its edges has been attributed to the Rio Grande rift, an elongated valley of rifting that extends from Colorado to central Mexico. The park combines the great plains and forests of the Rocky Mountains, harboring 73 species of birds, as well as mule deer, elk, black bears, coyotes, and mountain lions. Carlsbad Caverns National Park, in the southeastern part of New Mexico, was created to preserve over 100 ancient karst caves carved out and formed from an ancient coral reef. The reef formed in an inland sea about 265 million years ago, and the calcite speleotherms in the caves formed about 4 million years ago, when sulfuric acid dissolved the gypsum and limestone. The caves are highly variegated in shape and form. The caves are set in the Chihuahuan desert, at the intersection of the Rocky Mountains and southwestern bio-geographic zones. The oldest human occupation of the area dates to 12,000-14,000 years ago. Large colonies of cave swallows and Brazilian free-tailed bats raise their young in the caverns. El Malpais National Monument is located in west central New Mexico, near Grants. El Malpais means "the bad country" in Spanish, and that name refers to the volcanic landscape, a mass of jagged, jumbled, coal black rock. The oldest roads in the region are located within El Malpais Nacional Monument. Ancestral Puebloan people forged a trail as a connection between the Acoma and Zuni territories, a footpath picked along the razor-like lava. 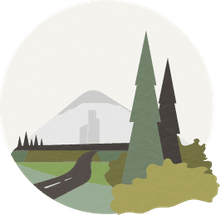 The region includes cinder cones, lava tube caves, and ice caves in a setting of sandstone bluffs, open grasslands and forests. Volcanic deposits are recent here—the McCarty's flow, a thin narrow deposit of jet black lava, was laid down between 700–1540 CE, according to archaeological research and Acoma oral history. El Morro National Monument, in central western New Mexico, near Ramah, gets its Spanish name for "the Headland," and it has been a popular campsite for hundreds of years, used by Ancestral Puebloans, Spanish, and American travelers. The main attraction in this great sandstone promontory is its 200,000 gallon rain-fed pool, an oasis that holds a reliable source of water in an otherwise arid landscape. The sandstone cliffs hold over 2,000 signatures, dates, messages, and petroglyphs made by the travelers over time. Atsina, a large pueblo ruin located on the top of the mesa, was built by Ancestral Pueblo people in 1275 CE. Housing between 1,000 and 1,500 people, it is the largest of the ruins in the park, with 875 rooms, square and round kivas, and cisterns arranged around an open courtyard. Fort Union National Monument, located in northeastern New Mexico, near Watrous, contains the remains of the largest 19th century military fort in the region. The fort was first established in 1851 as a small U.S. government outpost near the junction of the Cimarron and Mountain branches of the Santa Fe Trail. Fort Union was first built as a central point of supply in the 1850s, but its history includes three distinct construction periods. By the early Civil War in the 1860s, Fort Union was a defended post to protect the region from Confederate seizure. When Santa Fe was captured in 1862, it was the garrison at Fort Union that pushed the Confederate forces out. The third Fort Union was under construction by the end of the Civil War, and it contained a company post, a large quartermaster, and commissary depot for the military district of New Mexico. Its main role throughout the 19th century was to assuage the threat to the security of travelers along the Santa Fe Trail, as Native American warriors attacked their wagon trains. Gila Cliff Dwellings National Monument, located in southwestern New Mexico, near Silver City, is the only national park dedicated to preserving the Mogollon Culture, which was contemporaneous to the Ancestral Puebloan peoples but very distinct. The cliff dwellings of the Mogollon were built along the Gila River in the late 1200s CE, and were made up of mud and stone architecture constructed in six caves. The earliest sites mapped in Gila Cliff date to the archaic period, and were temporary shelters in the caves. The largest of the sites is the TJ Ruin, an open pueblo with about 200 rooms. The predominant geology of the area stems from Oligocene epoch volcanic activity which began about 30 million years ago and lasted 20 to 25 million years. Some of the most common trees are Ponderosa pine, Gambel's oak, Douglas fir, New Mexico juniper, piñon pine, and alligator juniper. Prickly pear and cholla cactus are common to the park, as are buffalo gourd, also known as coyote melon, and prickly poppy. Petroglyph National Monument, near Albuquerque, is one of the largest petroglyph sites in North America, featuring designs and symbols carved onto volcanic rocks by Native Americans and Spanish settlers for over 4,000 years. Archaeologists estimate there may be over 25,000 petroglyphs along 17 miles of escarpment. Ninety percent of them were created by the Ancestral Puebloans between 1300 and the late 1680s. A small percentage of the petroglyphs pre-date the Puebloan time period, perhaps reaching as far back as 2000 BCE. Other images date from historic periods starting in the 1700s, and represent signs and symbols carved by early Spanish settlers. The park is cooperatively managed by the National Park Service and the City of Albuquerque. Wildlife in the park include migrating and permanent residents, birds, insects and animals. In central New Mexico, the Salinas Pueblo Missions National Monument preserves three sites (Abo, Gran Quivira, and Quarai). The historic period pueblos were occupied by Puebloan people and, beginning in the 1580s, Spanish Franciscan missionaries. The now abandoned sites stand as reminders of the Spanish and Pueblo People’s early encounters. Abo is a strikingly red pueblo, covering approximately 370 acres. The number and size of unexcavated pueblo mounds suggest that when the Spanish arrived in 1581 they would have found a thriving community. In 1622 Fray Francisco Fonte was assigned to the Abo Mission, and he used some of the rooms for an early convent, until the Abo Church and Convento were built starting in 1623. Quarai is the smallest of the three units, with approximately 90 acres. It was likely a very large pueblo prior to Spanish contact, mainly due to the presence of a year-round water source flowing from springs along Zapato Creek. Don Juan de Oñate first visited Quarai in 1598, and the Quarai Mission and Convento were established in 1626, overseen by Fray Juan Gutierrez de la Chica. At 611 acres, Gran Quivira is the largest of the three units, and, prior to Spanish contact, it was a vast city with multiple pueblos and kivas. Mound 7, a 226-room structure used between about 1300 and 1600 CE, is the largest and only fully excavated pueblo at the site. During the excavation, an older circular Pueblo was discovered under Mound 7. 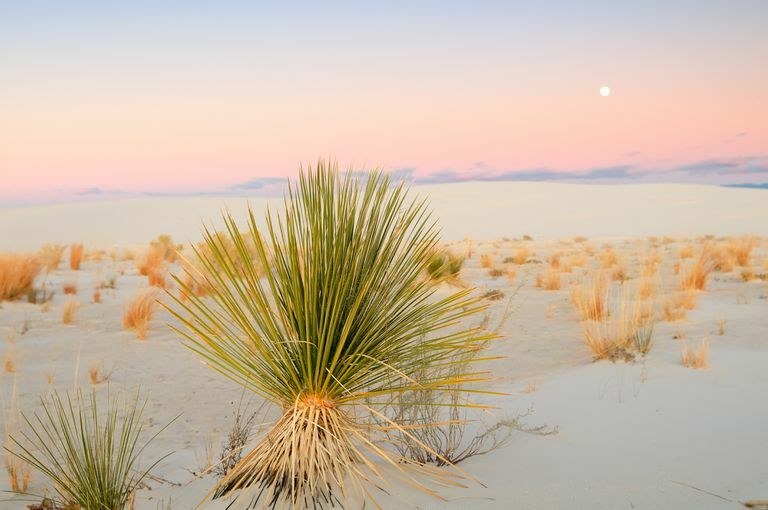 White Sands National Monument, located in central southern New Mexico, features an ocean of glistening white gypsum sands, in great wave-like dunes engulfing 275 square miles of desert. It is the world's largest gypsum dunefield, and White Sands preserves a major portion of it. Gypsum is a common mineral in the world, but it is extremely rare in the form of sand dunes. White Sands is located in a basin surrounded by gypsum-bearing mountains. Rainwater dissolves the gypsum out, collecting in a playa known as Lake Lucero. Some of the water in the basin evaporates in the desert sun leaving the crystalline form of gypsum known as selenite. Those crystals litter the surface of Lake Lucero. The soft selenite crystals break down into smaller pieces through the destructive forces of wind and water, creating the glittering expanse of the park.